I have two versions of one of the latest Tonic Studio releases to share today. 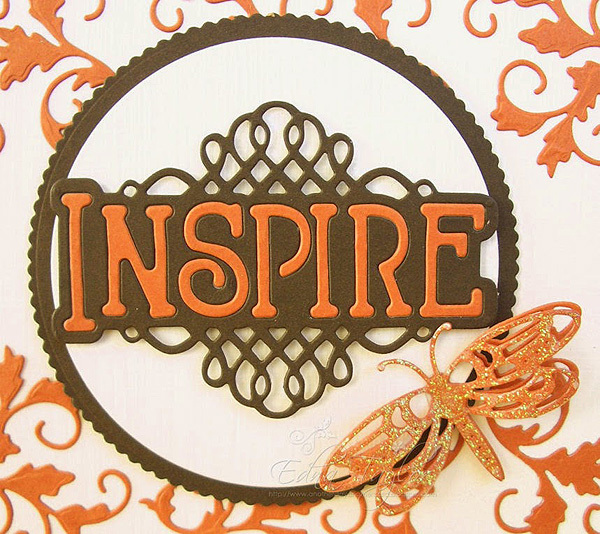 I just loved this word die and it's gorgeous swirly surround. I didn't feel that it needed much added to it so another wee favourite from the launch came in very handy too - the delicate dragonfly a petite Rococo which cuts beautifully and has lovely detailing on the body. 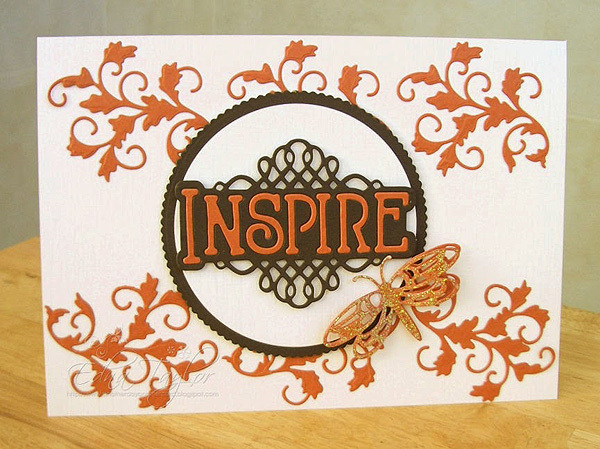 I have also used the lush petite Rococo - Acorn Swirl die repeating it across the card as a kind of border. The centre of the lettering in the Inspire just pops out which makes it ideal to add a second colour - it really makes it pop! The little dragonfly was cut once with plain card stock and for the second cut I adhered some glitter film to give it that wee taste of bling. 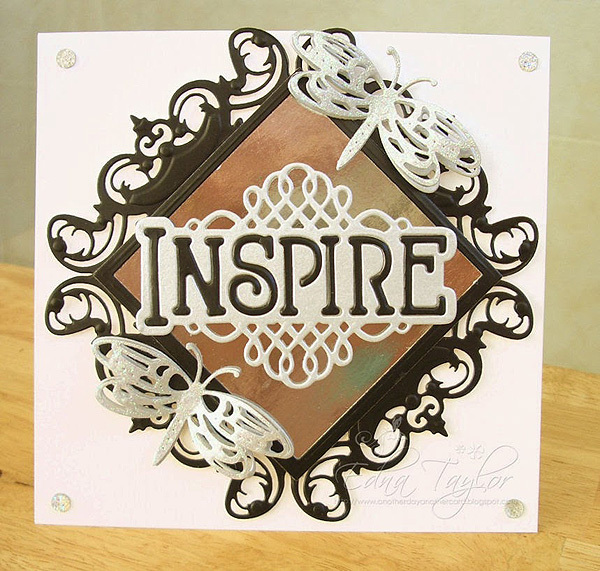 My second version uses the edge of the Vintage Comb Rococo die cut four times to form a frame. 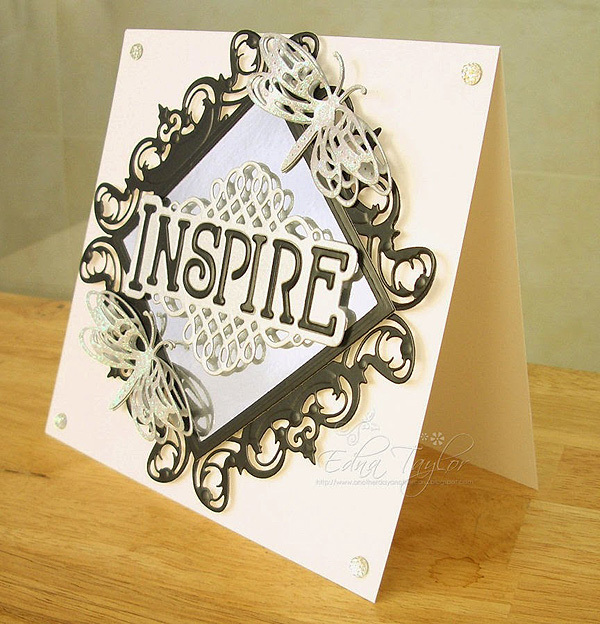 I kept this one simple too and used pearlescent silver card, black Adorable Scorable and silver mirri for the centre. The dragonflies were cut as for the first card with the glitter film added for a touch of bling. The sparklies on the corners are Marianne design gems.